This morning, Joe Paduda, at Managed Care Matters, did the workers’ compensation community a service with his blog post What Job?, in which he writes about the likely prospect of many jobs disappearing due to Artificial Intelligence (AI). AI is permeating every industry. For example, watch Motoman’s nearly human-free plant in Sweden as robots assemble, package, shrink wrap and ship thousands of Ikea bookcases, or a BMW plant in Germany as robots build the i3 electric car from scratch and with amazing precision, or CNN as its reporters show how Google’s driverless cars are navigating California and three other states. This is one of the defining issues of our time, and one in which I am profoundly interested. I suggest it is not hyperbole to predict that we are on the verge of an epochal change, something like a kind of mass extinction, and what’s going extinct is an enormous number of jobs. This change might be even more significant than humanity’s evolution from an agrarian to an industrial economy. Put that beside the Disappearing Act of US labor unions. Whatever you think of them, unions were good at negotiating hourly wages and other benefits like health care. But with only 6.7% of the private sector unionized today, that doesn’t happen anymore, so we’re left with a near total change in how we pay for health care today, as well as what we get for it, compared with how we paid and what we got for it in 1973. For example, we now have $2,000 (or more) deductibles, significant increases in employee premium contributions, the gold medal for the highest cost for health care in the developed world, way-over-the-top histrionics surrounding the Affordable Care Act, etc. You get the picture. The increasing need for both cognitive and social skills in entrance level jobs on track for middle class wages (presuming there is a middle class). See The Increasing Complementarity of Cognitive and Social Skills, by Catherine J. Weinberger, University of California, Santa Barbara. The continued accuracy of the 1965 technological development prediction, known as Moore’s Law. Simply stated, Gordon Moore, the founder of Intel, predicted that computing power would approximately double every two years, and it has – since 1965. Moore has recently revised his prediction to two and a half years through the next decade. Finally, the rise of what can be called the “intellectual” robots as exemplified by IBM’s Watson, which, in addition to handily beating all-time champion Ken Jennings at Jeopardy, is already doing a better job of reading XRays, CT Scans and MRIs than human radiologists. And here’s something to ponder along that line: Many agree that a workers’ compensation claims adjuster with a lost time caseload of 100 to 125 claims has the ideal caseload (a few nights ago at a Central New Jersey Claims Association meeting I was talking with a motivated and energetic workers’ comp claims adjuster for a company that shall go nameless – but it’s respected and well-known – who told me she’s carrying 180, and that’s the norm for her group). How would Watson do on that? Watson, a machine that sounds like the Hal 9000, never sleeps and could analyze thousands, maybe more, of lost time claims a second. IBM says that human involvement with Watson is critically important, but how many people does that mean? After the initial intake with the claimant, how much claim management could shift to Watson? You may not agree, but it seems to me that more than a few workers’ comp claims adjusters may soon begin to resemble that long-gone Woolly Mammoth. I’ll leave you with a question: Do you think it would have been appropriate if this subject had made it onto the agenda for the upcoming WCRI Annual Conference in Boston, March 10 and 11? Regardless of your answer, I’ll be there and will be happy to dive deep into the AI crease with any interested attendees. Over at Colorado Health Insurance Insider, Louise Norris has posted an excellent edition of Health Wonk Review: Healthcare Reform: The Path Forward. She notes that many of this week’s contributors focused on what we can do – including small tweaks as well as major changes – to build on what we’ve already got and make it better – thus “the path forward” theme. We’re 270 days away from the election – which you may view as an eternity or the flick of an eye, depending on your perspective. As the primaries unfold, we are at a critical juncture. What the path forward will be is up to every one of us in the choices that we make! Look to the Health Wonk crew to keep you informed about healthcare issues and policies. 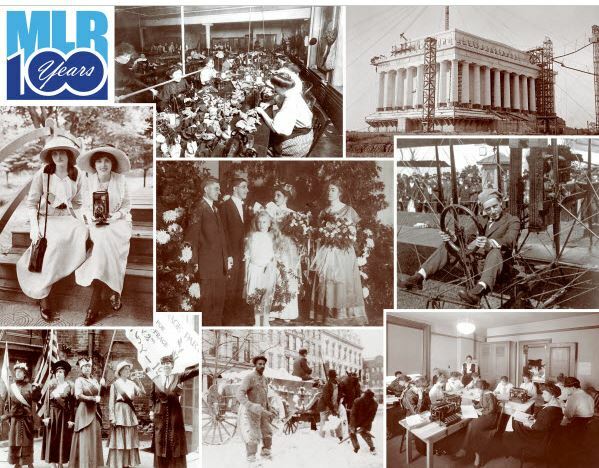 To commemorate its centennial, editors at the Monthly Labor Review have produced an excellent and fascinating report on The life of American workers in 1915 and the progress we have seen in the workplace since then. We think it’s worth your time to check it out! The context of the era is first established with a list of news events that were occurring at the time: a bill to give women the right to vote was rejected; labor leader Joe Hill was charged with murder, a charge that would lead to his execution; Alexander Graham Bell made his famous call to Thomas Watson in San Francisco, Typhoid Mary was arrested, Einstein formulated his theory of general relativity -these and several other key events shaped the era. The report goes on to discuss the demographics of the day and paint a portrait of daily life with many interesting facts about daily life ranging from where and how people lived (mortgages typically ranged from 5 to 7 years, but required 40-50% down) to how they commuted to work each day (streetcar, by foot or by horse) , what they typically ate for breakfast (corn flakes and puffed wheat cereals), what they wore for work clothing, how many hours they worked, what an average worker was paid ($687 a year), how they spent their leisure time, and more. It’s a fascinating and well-researched historical document. Although working in mines was notoriously dangerous, mill work could also be quite hazardous. BLS reported about 23,000 industrial deaths in 1913 among a workforce of 38 million, equivalent to a rate of 61 deaths per 100,000 workers. In contrast, the most recent data on overall occupational fatalities show a rate of 3.3 deaths per 100,000 workers. Regarding on-the-job safety, Green notes, “There was virtually no regulation, no insurance, and no company fear of a lawsuit when someone was injured or killed.” Frances Perkins, who went on to become the first Secretary of Labor (1933–45), lobbied for better working conditions and hours in 1910 as head of the New York Consumers League. After witnessing the 1911 Triangle Shirtwaist Factory fire, which caused the death of 146 mainly young, immigrant female garment workers in New York’s Greenwich Village, Perkins left her job to become the head of the Committee on Public Safety, where she became an even stronger advocate for workplace safety. From 1911 to 1913, the New York State legislature passed 60 new safety laws recommended by the committee. Workplaces have become safer, and technology has been used in place of workers for some especially dangerous tasks. In addition to this excellent article, there are a few noteworthy accompanying reports and articles in the sidebar, as well. Occupational changes during the 20th century charts how farmers, craftsmen, laborers and private household workers gave way to professional, managerial and service workers over the course of the century. Labor law highlights, 1915–2015 runs through legislation and trends that improved the worker’s lot – ranging from legislation that regulated child labor to laws prohibiting discriminatory practices for women and minorities. Two key legal initiatives were the introduction and adoption of workers compensation laws and workplace safety initiatives being legislated in 1970 with the passage of the birth of the Occupational Safety and Health Act (OSHA). Theodore Roosevelt, arguing in favor of workers’ compensation (then known as workmen’s compensation) laws in 1913, offered the story of an injured worker that summed up the legal recourse available for workplace injuries at the time. A woman’s arm was ripped off by the uncovered gears of a grinding machine. She had complained earlier to her employer that state law required the gears be covered. Her employer responded that she could either do her job or leave. Under the prevailing common-law rules of negligence, because she continued working she had assumed the risk of the dangerous condition and was not entitled to compensation for her injury. As the example illustrates, common-law negligence was not ideal for handling workplace injuries. Workers who noticed hazards could either “assume the risk” and continue working, or leave work; they were powerless to change the condition. Employers were at risk as well: they were vulnerable to negligence suits that could yield large, unanticipated awards for injured workers. Workers’ compensation, where employers insure against the cost of workplace injuries and workers have defined benefits in the case of injury, significantly reduced the risk for both parties. Our brief excepts don’t do these report justice. Kudos to all the people who produced these great documents and congratulations on 100 years of reporting on the American workplace! WCRI’s Annual Conference: Two Days of Research Data. What Could Be Better? The Workers’ Compensation Research Institute, located in the heart of Geek Heaven, Cambridge, Massachusetts, begins its 32nd Annual Issues and Research Conference in less than a month, 23 days to be precise. The conference is always interesting and often highly informative. Looking at the Agenda, this year’s effort seems to hit on both marks. The theme is Understanding Today to Prepare for Tomorrow, which I guess could be anyone’s daily Mantra, but is exactly what the WCRI has been doing since its founding in 1983. 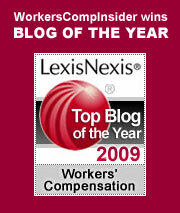 A lot has happened in the workers’ comp world since then. Perhaps the most astonishing development is the tremendous rise in medical costs. In the mid-1980s, medical costs comprised about 44% of total loss cost dollars, while indemnity payments took the lion’s share of 56%. Today, we see something entirely different, with medical costs taking up around 60% of the total. How times have changed! However, comparing medical to indemnity costs is a bit like the old apples and oranges cliché. By that I mean that medical costs, despite fee schedules, have been able to go on there own little rocket ride to the moon in most states. Indemnity payment increases, on the other hand, are everywhere limited and tied in some way to the rise in the average weekly wage in the various states. And since 1973, average hourly wages, measured in constant 1984 dollars, have increased by a paltry 4%. This is one of the reasons why, despite a continuing decrease in injury frequency, a concomitant increase in severity doesn’t move the indemnity needle. WCRI’s conference will dive into workers’ comp’s thorny issues with both feet. The session entitled Impact of Fee Schedules on Case-Shifting in Workers’ Compensation promises to be interesting, indeed. The relationship of case-shifting to the ACA has been something that many have opined about, but now I presume we’ll see some solid data. Another session that looks as if it will present both interest and fireworks is the Opt-Out Panel. Actually, there are two Op-Out Panels. WCRI is devoting nearly three hours to the subject. Seat belts should be fastened. I’m looking forward to this year’s conference. It’s happening March 10-11 at the Westin Copley Place Hotel. Hope to see you there. It’s Health Wonk Review week and Steve Anderson brings us the latest edition at medicareresources.org blog – if you are expecting a Valentine’s Day hearts and flowers edition, think again: Steve says this week, it’s all about the money: Money Changes Everything Edition of Health Wonk Review. It’s got everything from the rich getting richer to the Super Bowl of Drugs. And don’t miss a great analysis from Charles Gaba on how close can we get to zero percent uninsured. Many thanks to Bob for his thought leadership and tireless work in our industry over the years. We wish him well in his new endeavors! A New Approach to Opioids From FDA? At Evidence Based blog, Michael Gavin talks about how three physician leaders at the FDA recently published an article in the New England Journal of Medicine that suggests a new approach to how FDA should deal with opioids as a medication class. Workers’ and Feces and Bombs, Oh My! What’s a Guy Got to do to Get Fired Around Here?? According to the Bureau of Labor Statistics’ (BLS) Consumer Price Index calculator, what you bought for $100 in 1973 would today cost $533.82. Despite this, during that same period wage growth for the median hourly worker grew by less that 4%. 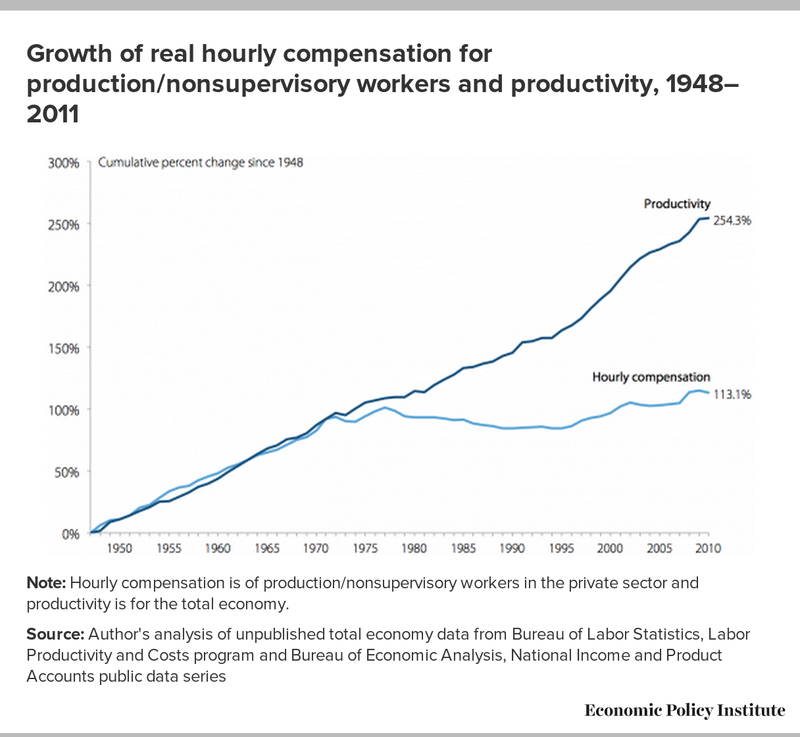 Moreover, as the following chart from the Economic Policy Institute (EPI) shows, while wages flattened out after 1973, productivity continued to increase at a steady pace through 2010. Everything seems to be going up across America except hourly compensation. That helps explain why our recent economic high hard one to the head, known as The Great Recession, has left so many families living paycheck to paycheck, one crisis away from living under a bridge. It also illuminates why the indemnity and medical benefits of workers’ compensation are critical to economic survival following a work injury. In 2015, ProPublica and NPR published a series of exposès that showed widespread disparity in the way the various states deal with work injuries. Workers’ comp professionals didn’t like the series much, complaining en masse that it was biased, agenda-driven and just plain wrong. Silly me, I thought the series actually made some important points, especially around the level of compensation for loss of function. Into this battle now rides Peter Rousmaniere, friend, colleague, Harvard MBA, WorkCompCentral columnist and all-around deep thinker. Mr. Rousmaniere spent a good portion of 2015 researching the economic consequences to injured workers with respect to how the different state workers’ compensation laws deal with the early days of a work injury. He illustrates his findings in The Uncompensated Worker: The Financial Impact of Workers’ Comp on Injured Workers & Their Families, published as a workcompcentral special report. In the Uncompensated Worker, Peter Rousmaniere creates the metaphorical Tim, a New York electrician earning the median wage for New York electricians. He then goes really deep into the take home pay hit Tim experiences following a work injury. He shows how Tim will always suffer earnings losses while injured regardless of how long he’s out of work, and he does it by considering the waiting period (the number of calendar days between the injury and when indemnity payments will begin), the “shortfall” (“The difference between a workers’ after-tax take-home pay and the amount of the replacement wages”), the “retroactive” calculation (the number of days an injured worker has to lose from work before being paid indemnity for the waiting period) and the maximum weekly benefit cap. While Tim’s 6% shortfall may not seem unreasonable, additional deductions further reduce his replacement wages. First, there’s a waiting period during which a worker receives nothing, a retroactive period (in most states) and a maximum weekly benefit cap. The amount Tim actually receives depends on the number of days he missed work. We can correlate work and calendar days for Tim by looking at a calendar and figuring his first lost work day on a Monday. If Tim misses three days of work, he receives nothing; losing six days of work yields close to one work day of replacement wages, and losing 10 work days yields five work days (seven calendar days) of replacement wages. With that New York backdrop, Rousmaniere then shows how Tim would fare in each of the other states. But he goes even farther. Drawing from Economic Policy Institute estimates, which create basic monthly household budgets based on household size and location “to attain a modest yet adequate standard of living,” he builds an EPI-estimated monthly basic budget for Tim and his family of four. He then lays out what happens to the family economy when Tim is out of work due to injury for an extended time, say more than a month. If Tim’s spouse works part-time, the family can’t afford the basic budget in 29 states; if the spouse doesn’t work, they’re under water to the tune of $2,200 a month in every state. This is sobering stuff. The 50-state and District of Columbia chart at the end of the report is nearly totally comprised of negative numbers. Reading the report, I’m left with this: Assume (as most claim adjusters tell me) that well over 90% of injured workers really are injured and want to get back to work as expeditiously as possible. Should those workers suffer economic deprivation simply because they had the misfortune to be injured at work? Does society have an obligation to ensure that families, already perilously close to the edge of the financial cliff, are not booted into the abyss because of that work injury? And, finally, is it time for indemnity and medical benefit parity among the states (for example, if Tim were injured in New Jersey he’d fare considerably better than in New York)? Peter Rousmaniere has performed a valuable service with The Uncompensated Worker. When (it should not be “if”) you read it, you’ll come away admiring the level of research and detail that went into producing it. I also hope you come away thinking their just might be a better way.